We like to start the day off with a special breakfast – and these hearty, filling pancakes are always a hit! 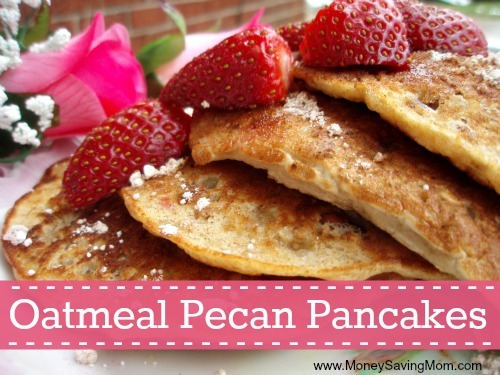 They are fairly simple to make, but the toasted pecans add that “special” factor. You could even make them heart-shaped if you’re feeling extra ambitious! Serve them with a side of red berries to incorporate the Valentine’s color scheme. The recipe is adapted from my mother-in-law, and is one my husband especially enjoys. These pancakes are a little bit healthier and a whole lot heartier than traditional pancakes, making them especially yummy during the cold winter months. For my pancake-loving family, nothing says “I love you” like waking up to a big plate of Oatmeal Pecan Pancakes, served with lots of butter and real maple syrup! *In place of buttermilk, you can put 2 Tablespoons lemon juice or vinegar in a 2-cup measuring container. Add milk until it gets to the 2-cup line, and let the mixture sit for 5 minutes before using. **To toast pecans, sprinkle them on a buttered cookie sheet and bake at 350 for 5-7 minutes, stirring occasionally. Watch them carefully so they don’t overbrown. In a medium-sized bowl, mix together the oats, ½ cup flour, powdered sugar, baking soda, baking powder and salt. Whisk in the eggs, buttermilk and vanilla and mix well. Add additional flour if needed (if using “homemade” buttermilk, you will probably need to add the entire amount of flour). Stir in the toasted pecans. Cook on a buttered griddle over medium heat. Mix together the topping ingredients. To serve, spread hot pancakes with butter, sprinkle with topping ingredients, and drizzle with warm maple syrup. I hope your family loves these delicious pancakes as much as we do! Can’t wait to try these … adding pecans to the shopping list ’cause we’re always well-stocked with the other ingredients. Breakfast-for-dinner is a favorite at our house.! Yes, please! My mouth is watering just looking at those beautiful pancakes! Yum!! I’m always looking for a new yummy pancake recipe, and this looks really good! Thanks for sharing! Aww… Thanks! It IS busy! If you have any tips on how to make it any easier, please share. 🙂 I feel like I’m in survival mode most of the time! My kiddos actually all just had birthdays recently (my baby turned 2 today-sniff!) so I guess it’s time to get Crystal to update the ages. America’s Test Kitchen has tested the adding lemon juice to milk method several times (they are America’s Test Kitchen after all! ), and the conclusion is that there is no need to wait 5 minutes or 10 minutes or any length of time. In test after test, there is no difference in the product between waiting for the lemon juice to work on the milk versus using the mixture immediately. Can you use regular oats instead of quick cooking? I was planning on making “breakfast for dinner” tonight, so when I saw these I had to try them. They were fabulous! Our 4-year-old loved them. Our exchange student didn’t like them, but she doesn’t like anything. 🙂 Thanks for the recipe! We made these this morning. They were delicious! We’re eating these now for dinner.. They’re so good!! 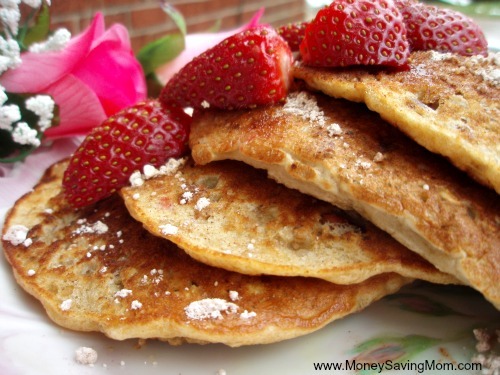 Doesn’t even taste like healthy pancakes, even my husband loved them! Yay! Thanks for taking time to let me know you liked them! My husband’s term for food he loves is, “restaurant quality.” That’s what he deemed these this morning. Yum! Has anyone had really runny batter? I can’t figure out what I did wrong, but it was more the consistency of crepe batter than pancake batter. I just added more flour, a little bit at a time until it felt like pancake batter. I doubled the recipe, and didn’t expect any leftovers, but they were very filling. We really enjoyed these!! The topping really brought the yummy flavor out. I’m so glad we had lots leftover for the freezer…an easy breakfast for another day! Yay!